Estimates are how long you think a task will take. 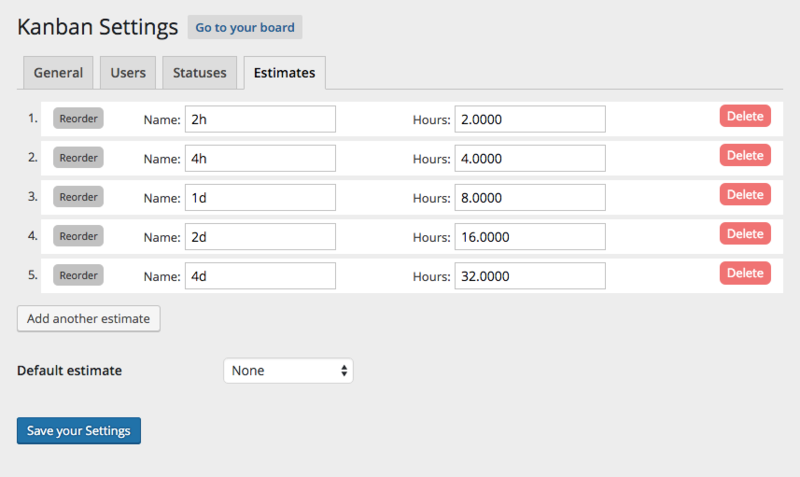 Access the estimates to choose from by going to Kanban > Settings and clicking on the “Estimates” tab.  The above are the default estimates, but you can change them to fit your needs. They’re listed in the order they’ll appear on the Kanban board. Click and drag the “Reorder” button to change the order (make sure you click “save” after you’ve made your changes!). 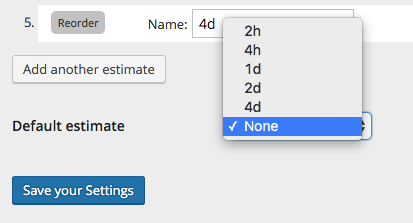 The numbers listed next to “Hours” indicate the total hours included in each estimate. In this way you can choose how many hours are included in a day. You can also do parts of an hour. For example, if you would like a 10 minute estimate, change “1” to “.1667”, as 10 minutes is .1677 of 1 hour. By default, when you create a new task, there is no estimate. If you would like all tasks to be assigned a specific estimate, set it here. To reset this, so any new task is unassigned, choose “None” from the dropdown.